November marks the end of our first year at 37 Duffy Place. And what an incredible year it has been. The program has been growing exponentially from the day we opened the warehouse doors and we are having a fabulous time! I thought the warehouse would be too big, too loud, too overwhelming but it has proven to be the perfect place for us. 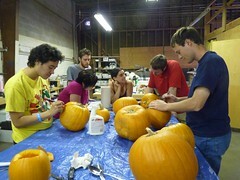 Large and messy, filled with power tools, paints, fabrics, computers, cameras and everything needed to create strange and wonderful projects – even carving pumpkins! Thanks to a very generous donation from the Moran family work will begin on the kitchen this week. We will start with installing a sink and a dishwasher – no more carting home the dirty dishes. Then we’ll hang the cabinets and put in a good floor. And, finally we will be able to cook together. 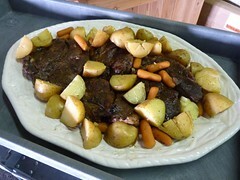 I am looking forward to working with our Autistry students to create new recipes and to share old favorites – like my Grandma’s pot roast. Autistry member, Julia Pozsgai was featured in an article in the Petaluma Argus-Courier. Julia has been working with Dan and Anna to create furniture. She is now taking custom orders and is working on a doghouse based on the Storybook Playhouse design for her first customer. Owen Bragg will be reading from his latest book, Ketinga the Cat at Book Passage in Corte Madera on Sunday Nov. 20th at 1pm. Please join us for this very special event. You can purchase both of Owen’s books online at the Autistry Book Store. Last month Robyn Steward dropped in to visit Autistry. She was on a speaking tour and wanted to see for herself what was going on at Autistry. 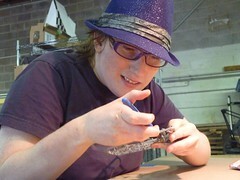 Robyn is a young adult with Asperger’s and she felt right at home in the Friday Workshop. She even painted a WarHammer figure! REMINDER: The Parent Support Group meets on Thursday, Nov. 10th at 7pm at Autistry Studios. This is a great group of people with lots of stories to tell and advice to share. Looking forward to another great year at Duffy Place! Petaluman Julia Pozsgai, 22, has autism, but has excelled in the craft of woodworking. 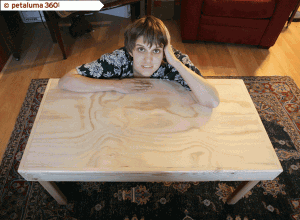 Among her many projects is this coffee table.